When most people think about minimalism they think about getting rid of stuff. Boxes of stuff in the garage, clothes in your closet and drawers, left over trash in the car, and all the little toys and sharp pieces to your kids stuff that always manages to find its way in the living room when you’re not wearing any shoes. But minimalism isn’t just about removing physical clutter. It’s also about removing the clutter in your schedule so you can make space for what matters most. Most of us have some kind of to-do list. Maybe yours is kept on a task app on your smartphone. Or maybe yours is in a notebook or planner. You’re to-do list may also be on sticky notes scattered throughout your office or jotted down on the bottom of your hand. Whatever method you use to keep your to-do list on doesn’t matter. What matters is approaching the things on your to-do list in a way that allows you to do the most important things. And chances are that probably means trimming your list down. 1. Don’t keep multiple to-do lists. It’s hard to keep track of everything you need to do if it’s scattered all over the place. Keep all of your to-dos in one place. It doesn’t matter if it’s on paper or online. Have one tool you keep with you wherever you go so you can jot down the things you need to do so you don’t forget to do them. Having a central place for all your tasks will keep you from wasting time trying to find everything you need to do. 2. Before you put something on your list decide if it’s really worth doing. It’s so easy for us to put things on our to-to list that we don’t always take the time to pause and decide if it’s something worth doing. Before we put anything on our to-do list we need to ask ourselves if it aligns with our priorities. We all have to do things we don’t enjoy but need to because it supports our priorities in one way or another. But when we find ourselves spending more and more of our time doing things that don’t line up with our priorities we need to evaluate those activities and make some changes. 3. Don’t keep anything on your to-do list for longer than a week. To-do lists have a bad habit of growing. We don’t do ourselves any favors by adding things onto our list without taking some things off. Make a commitment to not keep anything on your to-do list for longer than a week. 4. If it’s on your list longer than a week schedule it, delegate it, or delete it. After seven days make an appointment on your calendar to complete the task or delegate it to someone who will take ownership of it. If you find you don’t have time to do that then the best thing is probably to delete the task and not do it at all. That can be hard, but it may be the best thing for you. To-do lists are a necessary part of life, but they don’t have to get the best of you. When you learn to trim your list down to the things that really matter most you’ll find more joy and happiness in what you end up doing. As I go zero waste, my to-do list is growing longer and longer! You have given me a good tip to start scheduling things on my Google calendar so I have some accountability in my plans! 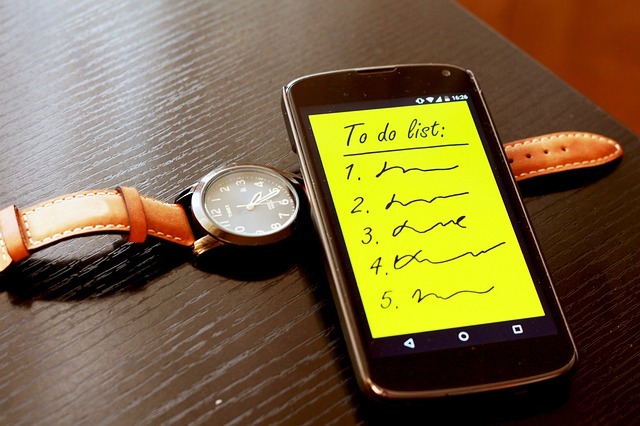 What is the best Android App to use for To-do list? Free or very low cost? Wunderlist is my personal favorite. It works on all platforms, has a beautiful interface, let’s you set reminders, have tons of folder and subtasks, and the best part is it’s free. I highly recommend it. I like this longer than a week tip – thanks! Thanks Madeline. That tip has helped me out a TON. Like the idea of keeping to a 7-days timeframe. Probably brings about greater focus. Thank you!